Single lever, pull-out faucet. Chrome/Stainless steel/Bronzed Cafe/Anthracite. The new TORINO is an excellent eco-option with a maximum flow rate of 6.4 L/min at 4.1 Kg/cm2 for better water conservation & energy savings. The new TORINO is an excellent eco-option with a maximum flow rate of 6.4 L/min at 4.1 Kg/cm2 for better water conservation & energy savings. 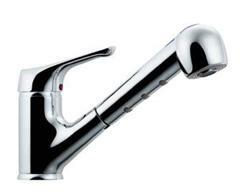 The Torino faucet is certified by the ECP, an Environment Canada Program. Use colours as a guideline only. Colours displayed may not match actual colour.